The Holy Father has asked the Jesuits across the world to promote a network of prayer as a new initiative from the former Apostolate of Prayer. Each province has a national contact for this work, ours being Fr. David Stewart SJ. 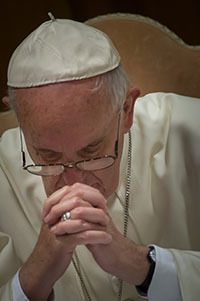 Each month the Holy Father will have a main prayer intention for people to use as part of their daily prayer, and he will also announce an "urgent intention" for people’s prayer. A short video based on the main intention published each month and known as 'The Pope Video'. Fr. Stewart publishes a webpage each month with prayer reflections based on the main intention. Bookmark this page and revisit monthly for the latest intentions. Further information through the Pathways to God and Click to Pray websites. Image reproduced courtesy of The Catholic Church in England and Wales. “The presence of doctors, nurses, and other health care workers in war-torn areas is a sign of hope. They are wise, valiant, and good-hearted people who, following their vocation, work under extremely dangerous conditions. Link to Fr. Stewart's webpage for April. NB. All previous videos can be viewed on our YouTube channel. Today, our modern society, which is so advanced, continues to persecute people because of their faith. There are people who die and who are persecuted for following Jesus Christ, not to mention the discrimination against Christians in so many countries where they are not acknowledged, or where their existence is subtly rejected through insults and unjust demands. Let us defend their rights! Link to Fr. Stewart's webpage for March. There are issues where you are morally obligated to take a side, such as human trafficking. You cannot be neutral. If you don’t take a stand against it, if you don’t do something to fight it, you’re contributing to the continued existence of this tremendous injustice. Open your eyes to reality. Open your heart to the victims. Link to Fr. Stewart's webpage for February. Young people who move, who throw themselves into the adventure of faith, who follow Mary´s example. Thousands, tens of thousands, even millions of them are gathering this month of January in Panama for the 2019 World Youth Day. Let us share with them the joy of the Gospel. "You young people have, in the Virgin Mary, a reason for joy and a source of inspiration. Take advantage of the World Youth Day in Panama to contemplate Christ together with Mary. Let us pray the Rosary together for peace, each of us in our own language. And ask for strength to dream and to work for peace. Let us pray that young people, especially in Latin America, follow the example of Mary and respond to the call of the Lord to communicate the joy of the Gospel to the world." Link to Fr. Stewart's webpage for January. Link to Fr. Stewart's webpage for December 2018. Link to Fr. Stewart's webpage for November 2018. Link to Fr. Stewart's webpage for October 2018. Link to Fr. Stewart's webpage for September 2018. Link to Fr. Stewart's webpage for August 2018 is unavailable. Link to Fr. Stewart's webpage for July 2018. Link to Fr. Stewart's webpage for June 2018. Link to Fr. Stewart's webpage for May 2018. Link to Fr. Stewart's webpage for April 2018. Link to Fr. Stewart's webpage for March 2018. Link to Fr. Stewart's webpage for February 2018. Link to Fr. Stewart's webpage for January 2018. Link to Fr. Stewart's webpage for December 2017. Link to Fr. Stewart's webpage for November 2017. Link to Fr. Stewart's webpage for October 2017. Link to Fr. Stewart's webpage for September 2017. Link to Fr. Stewart's webpage for August 2017. Link to Fr. Stewart's webpage for July 2017. Link to Fr. Stewart's webpage for June 2017. Link to Fr. Stewart's webpage for May 2017. Link to Fr. Stewart's webpage for April 2017. Link to Fr. Stewart's webpage for March 2017.